Hydrocarbons, Oil, Follow: The “holes” in the dolomite rock are covered, sometimes filled, with oil. It is estimated that more than 60% of the world’s oil reserves (as of 2106 - not including fracking) is found to be hosted within holes in carbonate rock. The Herkimer district can be viewed as a “fossilized” oil deposit within a carbonate rock. The oil is not flowing anymore but all the signs are left behind to tell us that it was at one time liquid. See the hydrocarbon page for this evidence. The presence of hydrocarbons in the birth place of Herkimer diamonds is probably the single most influential factor contributing to their “diamond like” form and brilliance. Although we are still studying the evidence left behind from this mixing of oil and quartz bearing fluids in the Herkimer Mining District, we can say with fairly high confidence the following: When Herkimer diamonds are found within cavities that have a strong presence of black hydrocarbon they have a high chance of being being both clear and brilliant, and also containing curved quartz features. 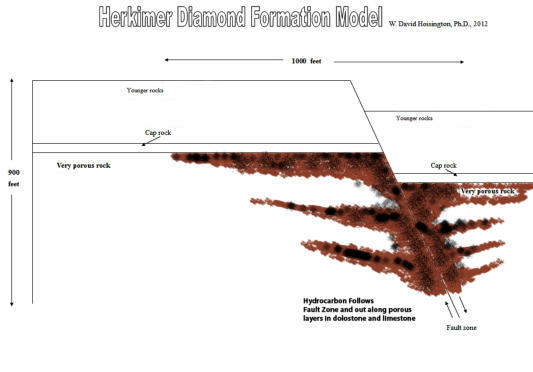 This is something Herkimer diamond miners and collectors have known for decades and yet there has not been a geologic theory put forth to explain this feature that is almost universal across the entire district. They have been given the name “jewelry boxes” because of the high brilliance shown by the Herkimer diamonds that are dug out of the black mass within. From our ongoing Sphere-Curved Feature research project we can also say that the Herkimer diamonds in these black pockets will contain microscopic evidence of quartz-hydrocarbon interaction while the fluids were making Herkimer diamonds.